This is an important step in a growing effort to raise awareness of the needs along 82nd, in providing avenues for feedback about needed changes, and in learning about potential state funding from the 2015 legislature. The event will include brief presentations from Kelley Brooks from ODOT, Brian Wong from the 82nd Avenue Improvement Coalition, and Randy Tucker from Metro/Oregon Transportation Forum. They will discuss the current planning process for an 82nd Ave. transportation study, the process for potentially transferring 82nd Ave. from the state to the City of Portland, and an update on potential funding sources for improvements along 82nd. With the 2015 legislative session approaching, now is a great time to get plugged in.There will be time for public comments, followed by brief remarks from legislators and other elected officials; please come join us! A busy weekend in FoPo! There are several exciting activities happening in and near our neighborhood this Saturday, July 26! Who: Anyone who is interested in learning more about street trees, improving our neighborhood’s tree canopy, and/or seeing different parts of the area! Volunteers are collecting data on the type, health, and location of street trees in our neighborhood in order the prepare a street tree plan. The plan will identify gaps in canopy coverage and whether there is sufficient diversity in the types of street trees in the neighborhood. The work day is from 8:30-noon on Saturday, and volunteers are meeting at Holgate Library. You don’t need to know about trees, just be interested in finding clues to help identify them! Interested? You can sign up here. You can also show up the day of! What: SE Neighborhood Kickball Tournament Game #4 – Foster-Powell v Mt. Scott-Arleta! Who: FoPo and Mt. Scott-Arleta residents and fans! The Foster-Powell Pirates v Lents Rebels ickball game on the 20th was a ton of fun, and Foster-Powell also won! We now advance to the next bracket. Get more event information here. A busy weekend in Foster-Powell! 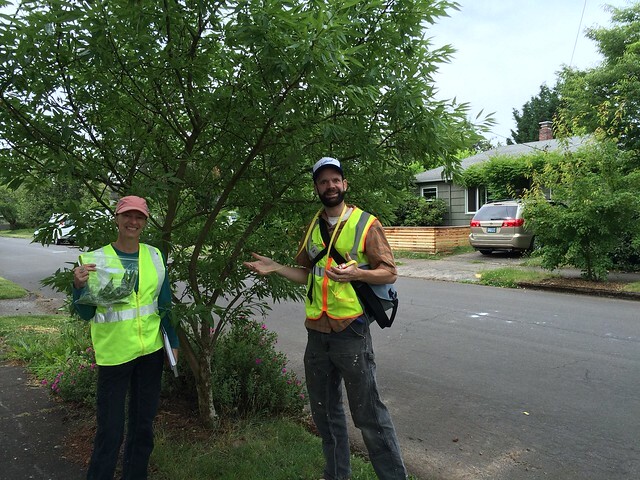 The 1st Ever Foster-Powell Street Tree Inventory work day is on Saturday, June 21, from 8:30-noon! This is the first of 4 work days scheduled for this summer. Volunteers are needed to identify, measure, and map street trees for inclusion in a neighborhood tree plan! We still need volunteers for all 4 inventory work days, and it’s not too late to sign up. This wonderful volunteer-led event is free! Also, you can purchase raffle tickets for great prizes at each stop. Foster Love bike bells will also be available for sale. Proceeds support next year’s garden tour and other neighborhood association activities.